One of the biggest annual events on television is just around the corner. Yes, Shark Week is coming to Discovery at the end of July, and EW has our first look at this year's host, Andy Samberg...or, sorry, their Chief Shark Officer. Samberg will not only host Discovery's 24th go at the week of the shark BUT he's also simultaneously filming his own special called Shark City. When asked about the hosting gig, Samberg simply replied that "everyone loves Shark Week. I love Shark Week. I was just so flattered. The pitch was that I would get to fly to the Bahamas and literally swim with sharks, and I was thinking there's no way I would ever have the balls to do that on my own, so I went for it." I'm a huge Samberg fan, and although I don't PVR shark week or anything, I do tend to gravitate towards Discovery while it's on. Having Samberg host will only encourage my remote. Here's a look at Samberg swimming with sharks, and you can hop over to EW to watch a funny tease (with Samberg manning a one-person submarine, singing a little fish song) and see a few more shots of the Chief Shark Officer in action. 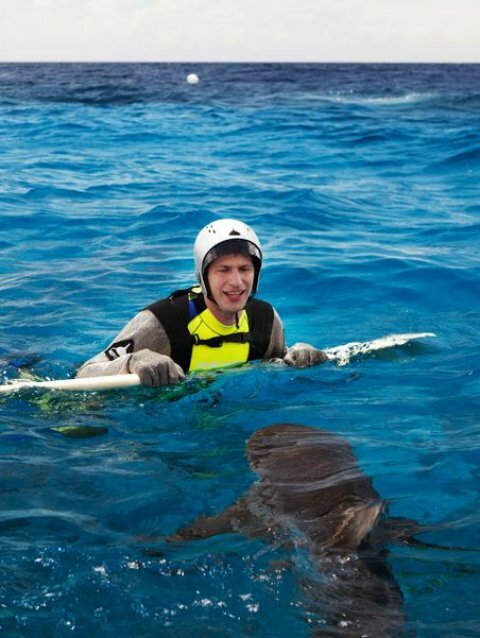 Shark Week kicks off on Discovery on July 31st, 2011, with Samberg's Shark City airing at the tail end on August 4th.